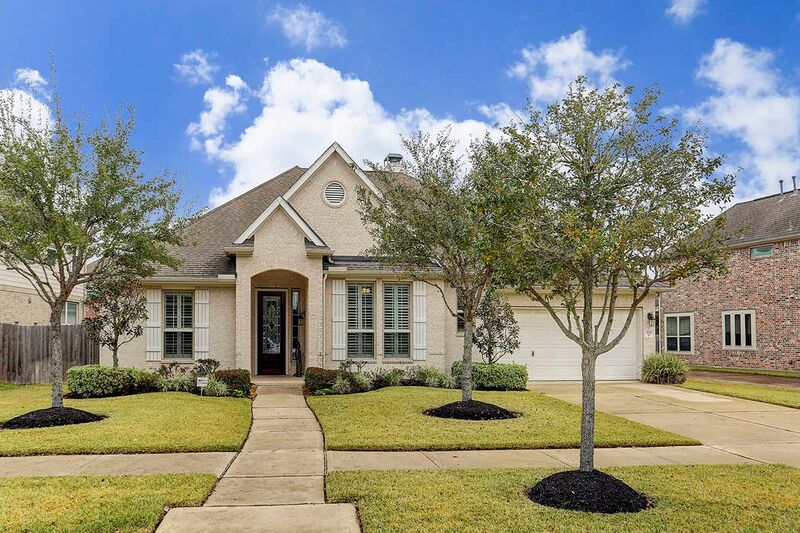 5511 Dalton Ranch Lane, Sugar Land, TX 77479 | Martha Turner Sotheby's International Realty, Inc. Welcome to 5511 Dalton Ranch Lane! This one-owner home has wonderful curb appeal! Note: Neither the home/property, nor the street flooded during Hurricane Harvey. 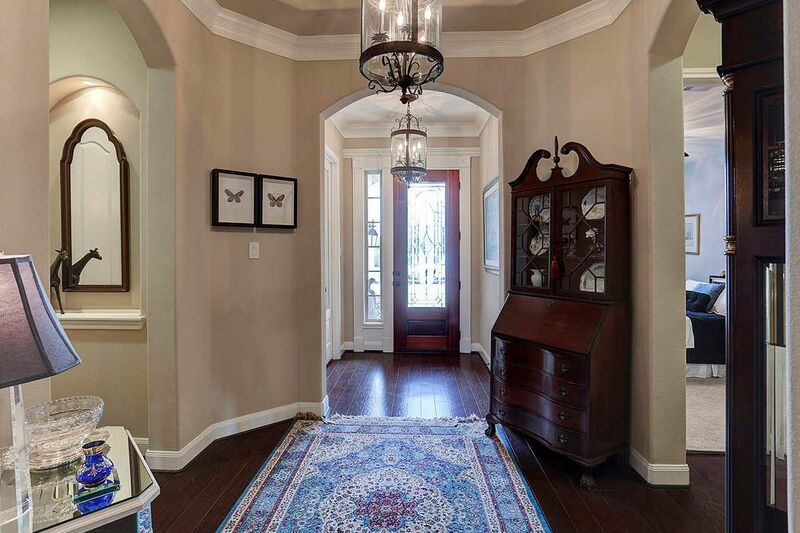 The beautiful mahogany front door with leaded glass inserts welcomes you into this warm and inviting home. Currently used as a Study, this room offers lots of options. 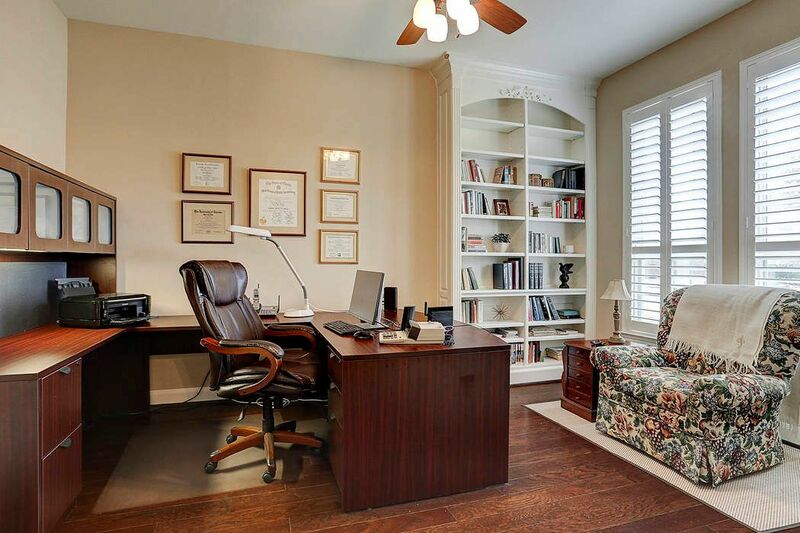 With the built-in bookcases on either side of the seating area, it makes for a perfect personal library. Also, throughout the home notice the plantation shutters. Another angle of the Study. 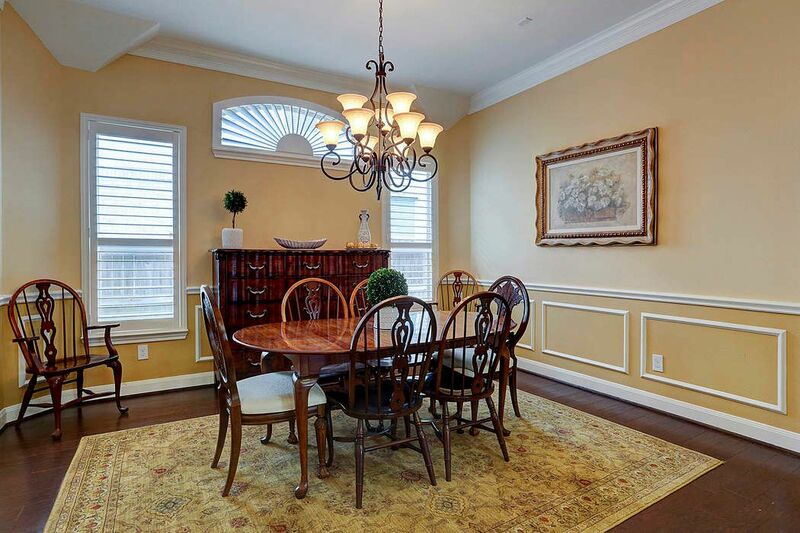 The Formal Dining Room has an oil rubbed bronze chandelier, chair-rail moldings as well as crisp white crown molding. The transom window above the buffet, with its custom made plantation shutter, sets this room apart. 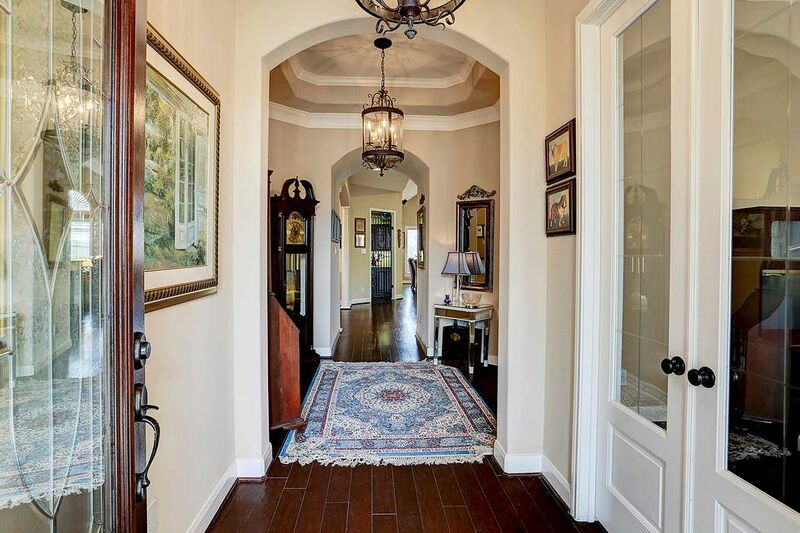 This angle of the Dining Room highlights the elegant columns that support the arched entrance. 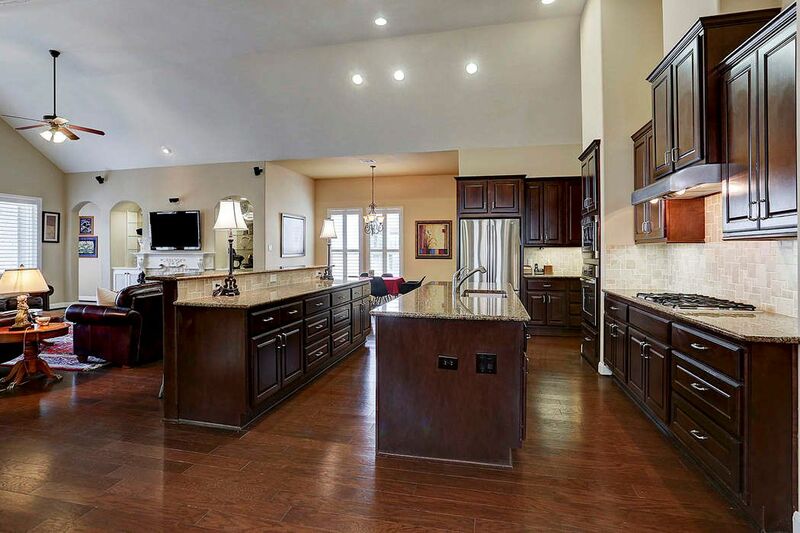 Captured in the picture is also the open floor plan of the home along with the double island kitchen. 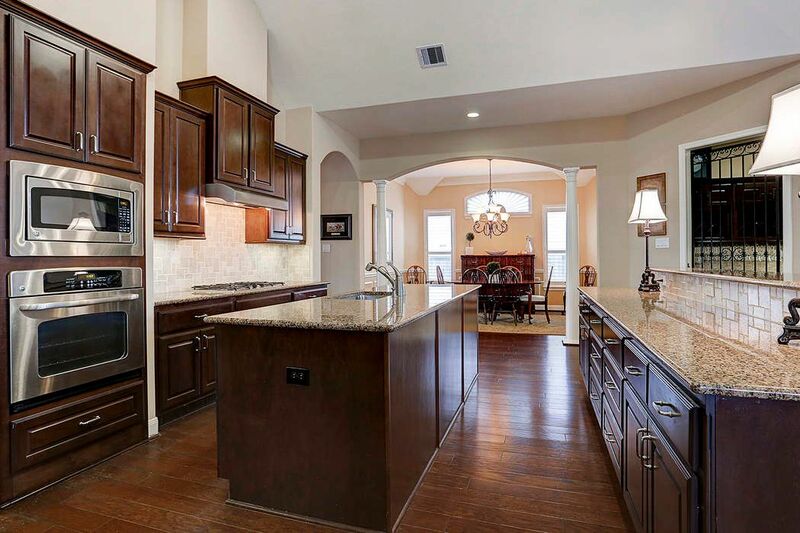 This fabulous kitchen is a chef's dream! 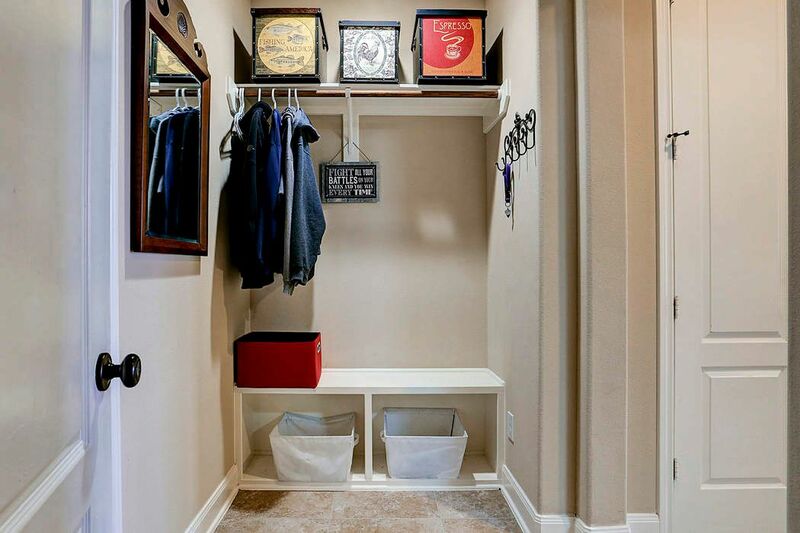 An abundance of prep space and storage awaits you. The stained wooden cabinetry is a lovely contrast to the St. Cecilia granite and tumble marble back splash. Stainless steel appliances round out this space. 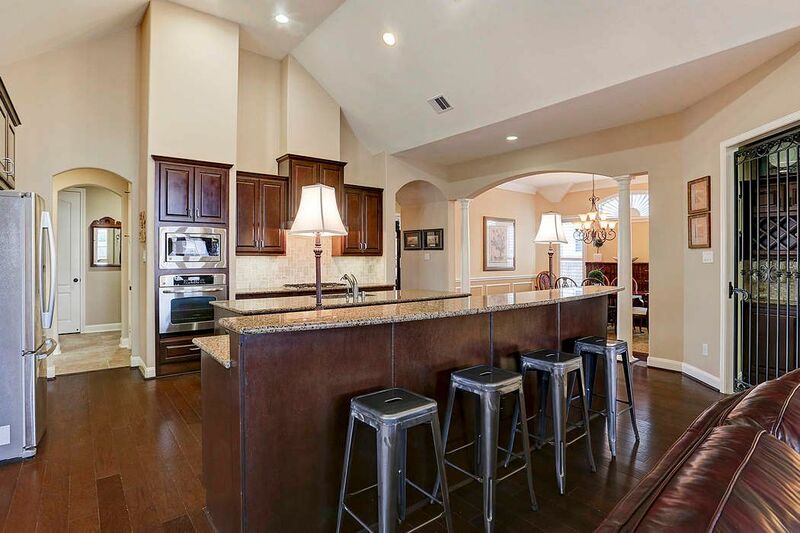 The proximity of the Dry Bar to the Dining Room and Kitchen is ideal. Notice the detailed wrought-iron door. 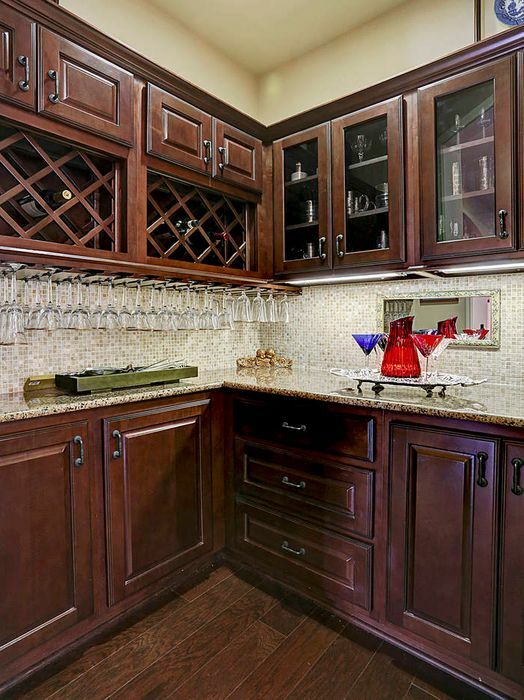 The Dry Bar/Butler's Pantry is perfect for storing serving pieces, crystal or your china. The glass front cabinets are a nice surprise! A five-burner gas cook-top with stainless steel vent-a-hood is opposite the sink. In the distance, the French Door stainless steel refrigerator is negotiable. 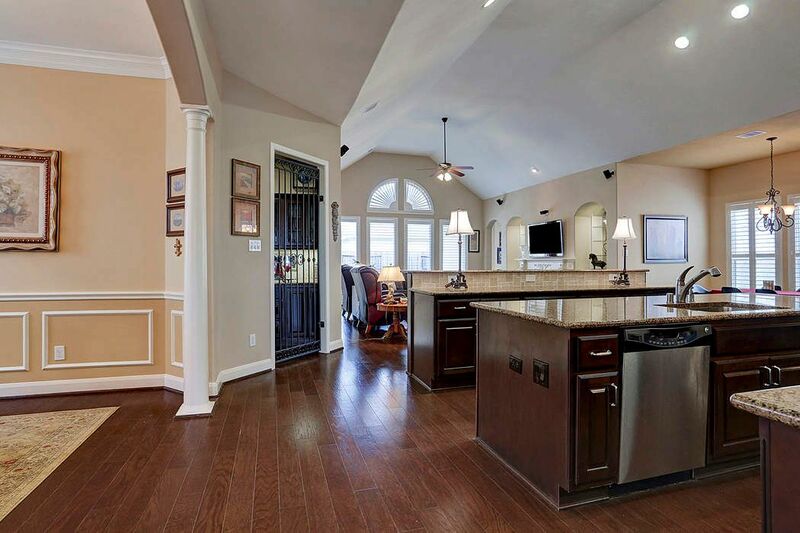 This shot highlights the seamless hardwood flooring, and the overall open flow of the home. 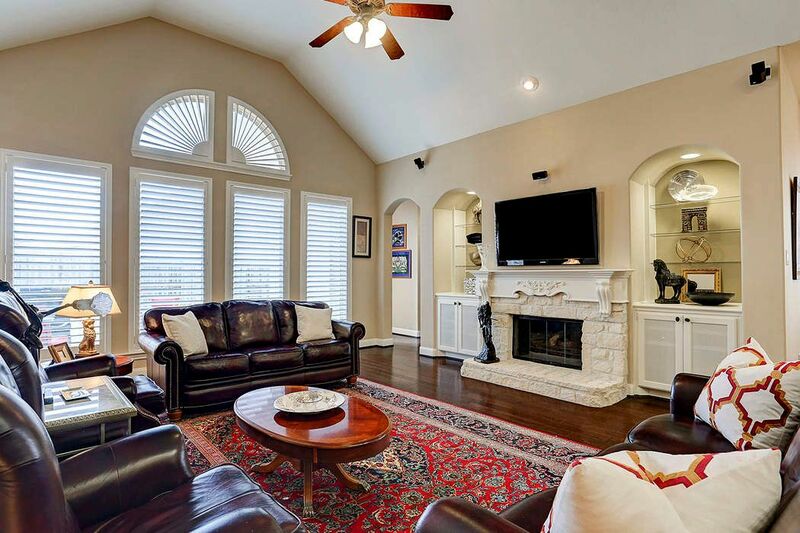 The Family Room is anchored by the stunning stone, gas-burning fireplace which can be turned on by a hand-held remote. Beautiful built-in cabinets showcase personal treasures. 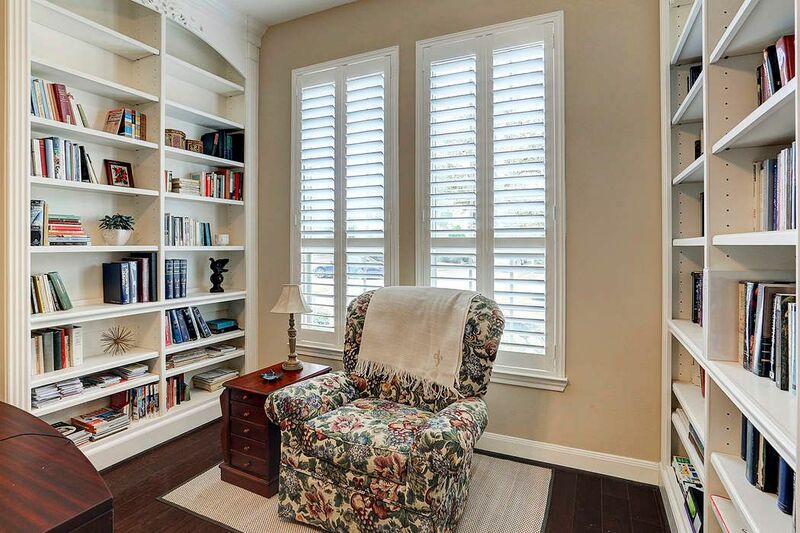 The custom plantation shutters nicely filter natural light into this wonderful Family Room. 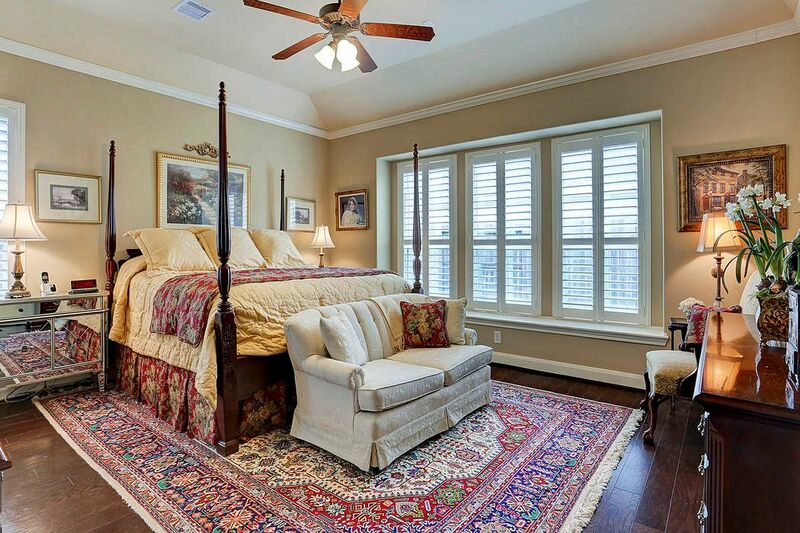 The stunning Master Suite is located at the back of the home. The hardwood floors, coffered ceiling, crown molding, ceiling fan, and plantation shutters truly make this room a private retreat. 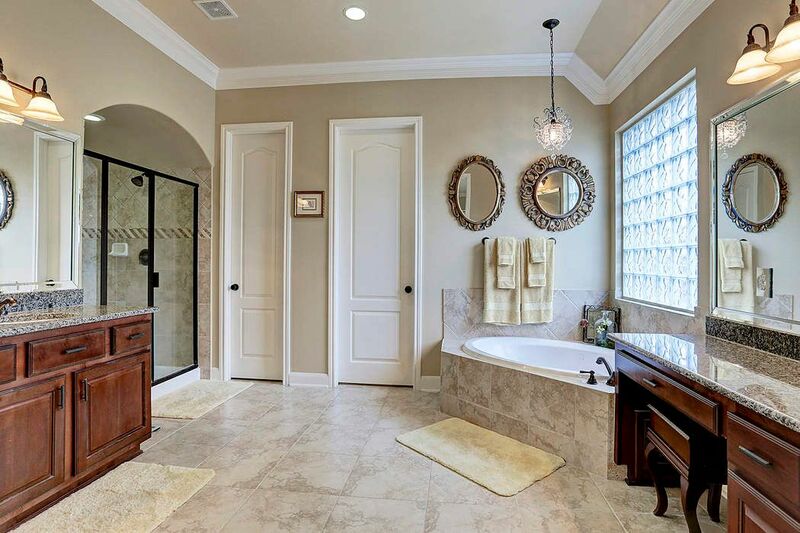 The Master Bath is a "His and Her" bath! 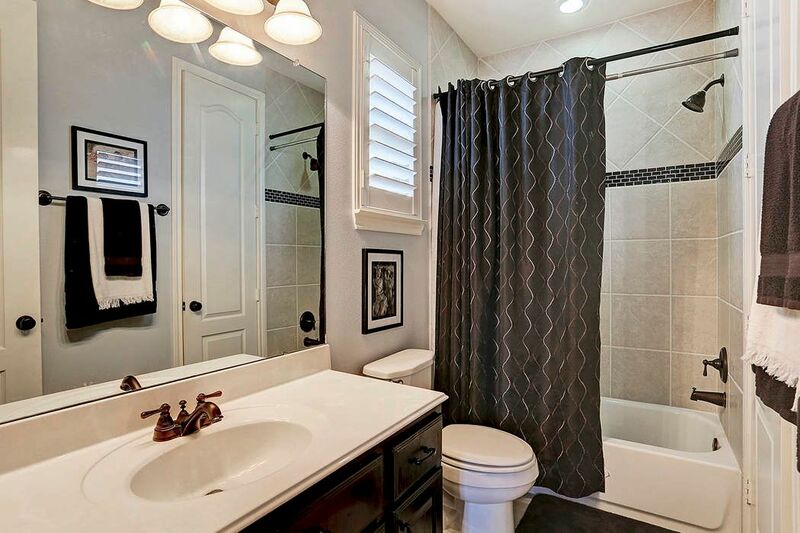 It has porcelain tile floors, granite counter tops, a jetted tub, and separate walk-in shower. 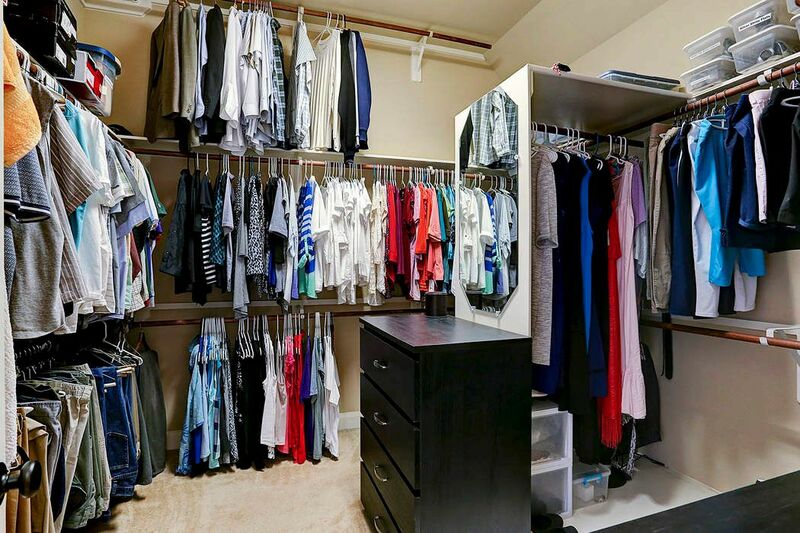 The Master Closet has an abundance of hanging rods, and even enough room for a stand alone chest of drawers. The oversize room enjoys a sitting area, and en suite bath. It actually could be a secondary master and is located at the front of the home. 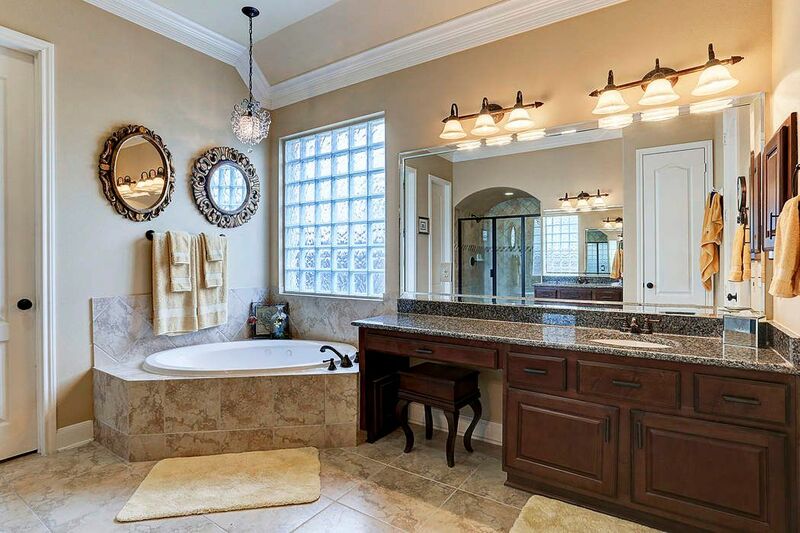 This bath has a shower/tub combination and a closet (not shown in photo). Secondary bedroom with ceiling fan, carpet and plantation shutter. This Hollywood Bath is accessible to both secondary bedrooms. Secondary bedroom with ceiling fan is currently being used as a sitting room. Mudroom with storage cubbies and hanging space. 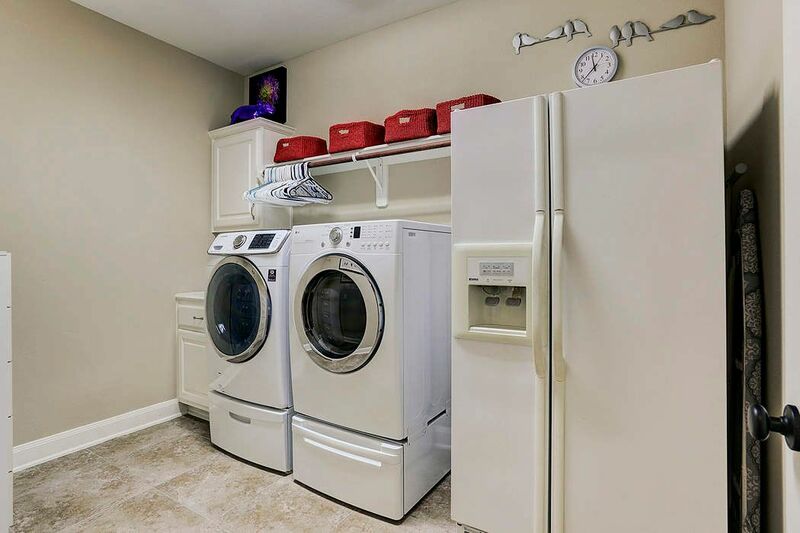 Indoor Laundry Room is generously sized with ample room for a secondary refrigerator. NOTE: The washer/dryer and refrigerator are all negotiable. 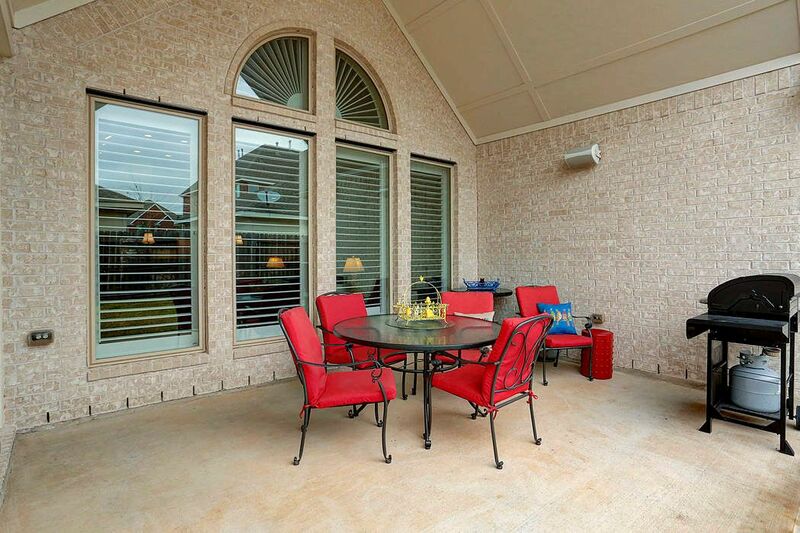 The covered Patio is a great outdoor entertaining space. Note the speaker which is connected to the indoor sound system. 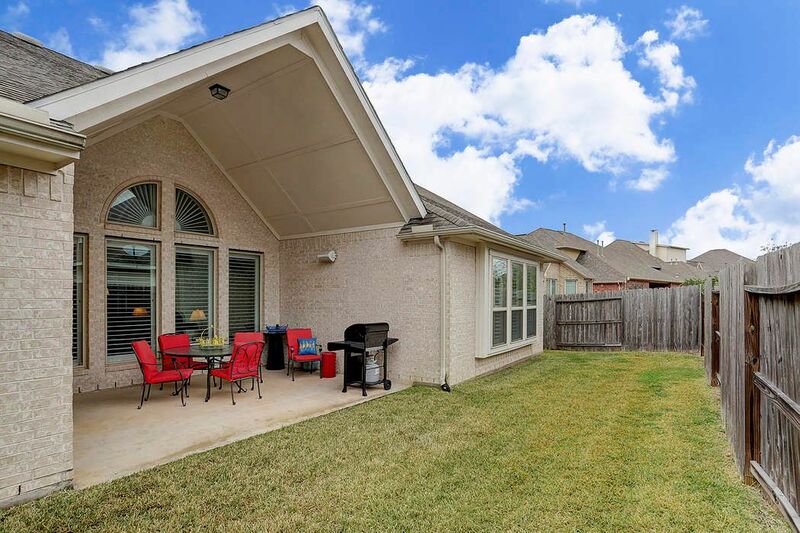 There is plenty of space to add an outdoor summer kitchen! 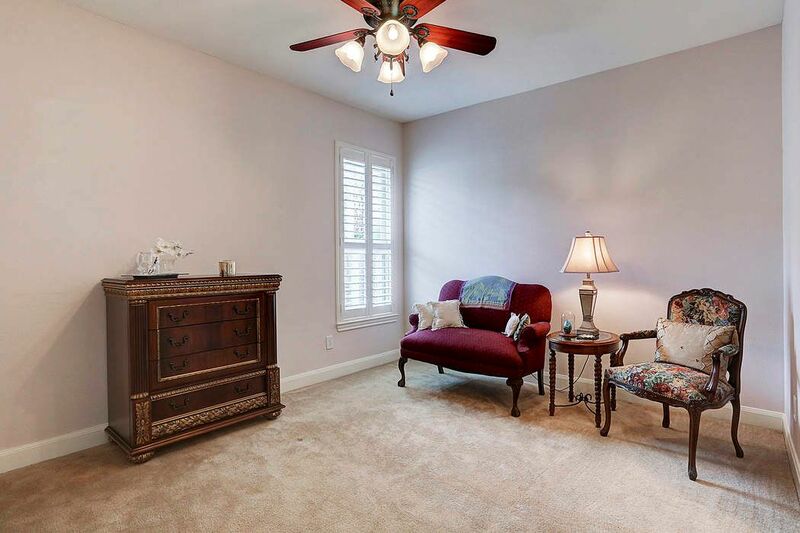 $427,000 4 Bedrooms3 Full / 1 Partial Baths3,391 sq. 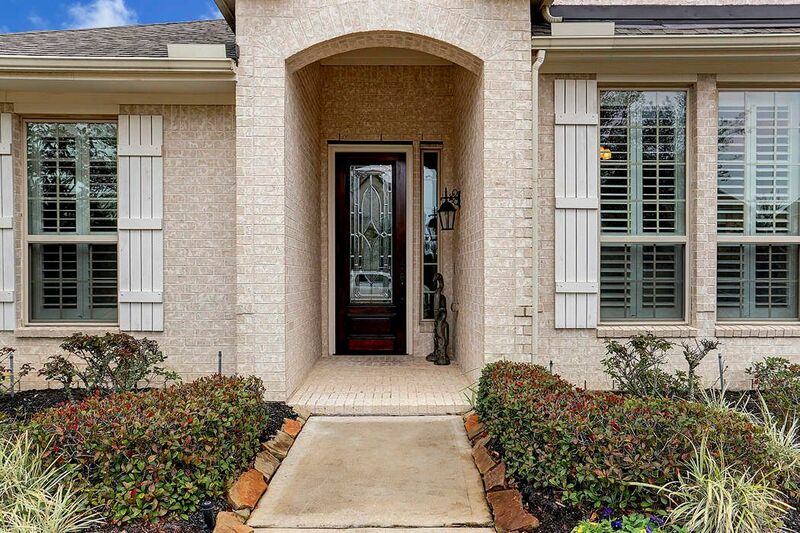 ft.
A great opportunity to move into a beautiful, one-owner home in desirable Riverstone. Neither house nor street flooded during Harvey. 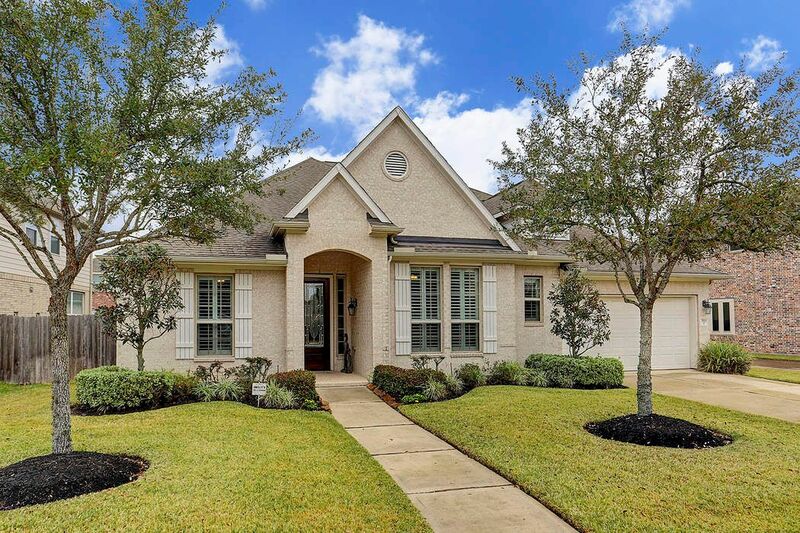 Stunning curb appeal immediately draws you to this property with beautiful landscaping, lovely flower beds including four live oaks. 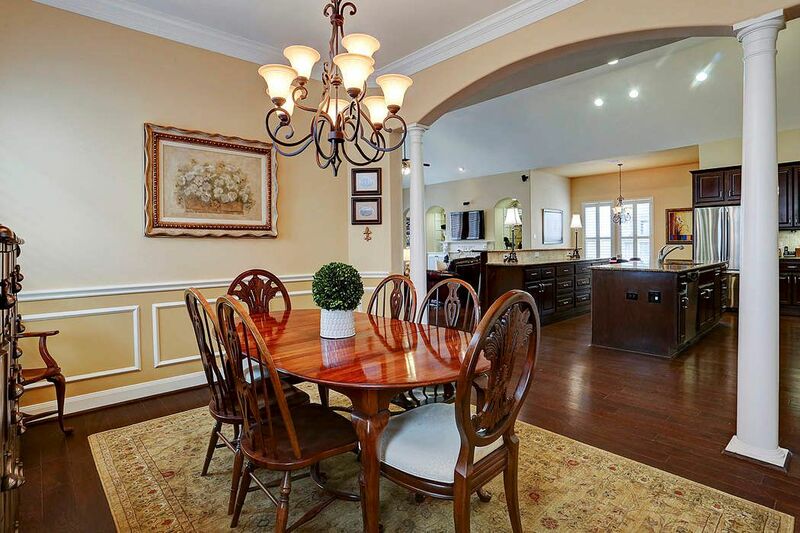 A meticulously maintained home which is "move-in" ready. This almost 3,400 s.f. home has 4 bedrooms and 3.5 baths. 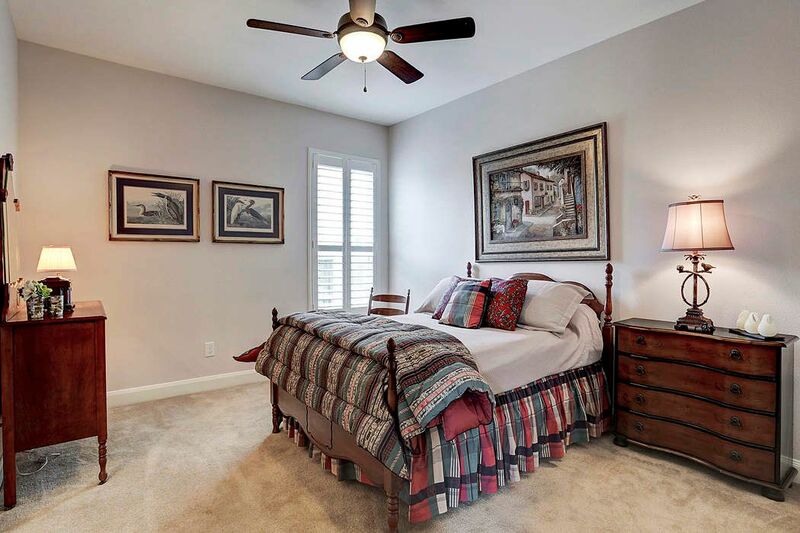 Hardwood flooring spans most of the home including the master suite (carpeting in all secondary bedrooms). Open floor plan. 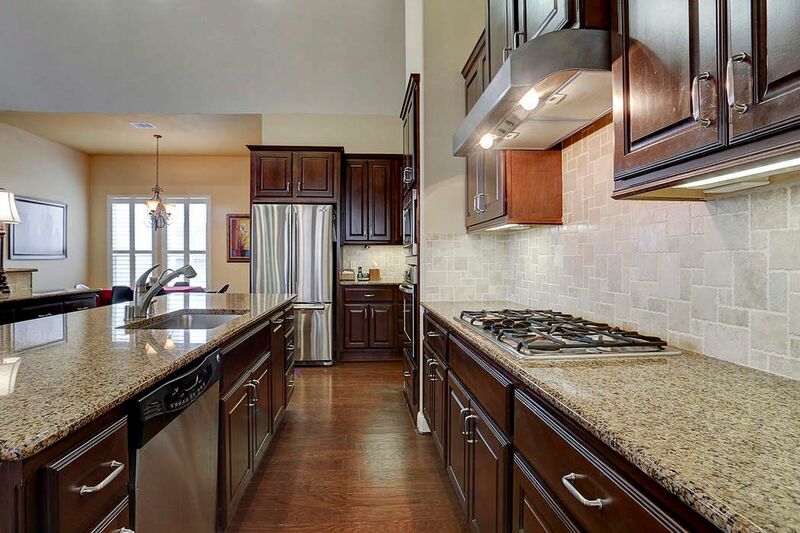 The kitchen has two generously sized islands (refrigerator included). Off the kitchen is the mudroom and laundry (washer and dryer included). 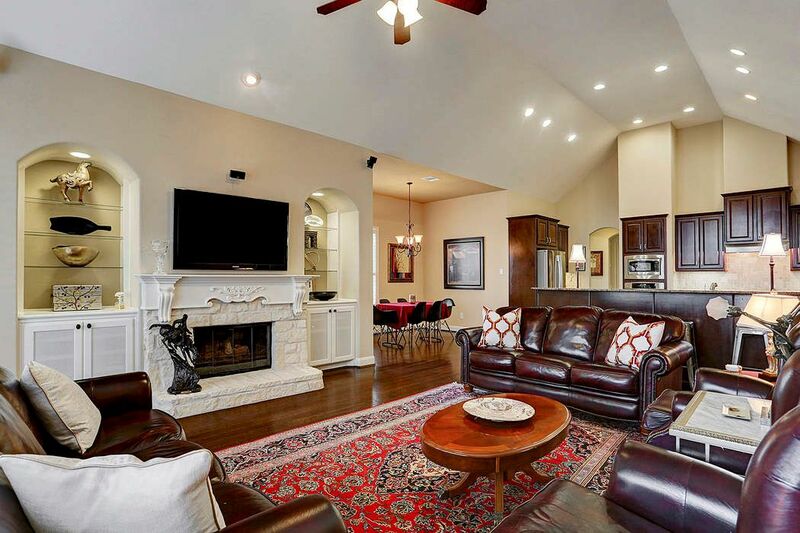 The expansive family room enjoys a gas-burning fireplace and includes a home theater system. The oversized secondary bedroom at the front of the home with its en suite could easily be a secondary master. 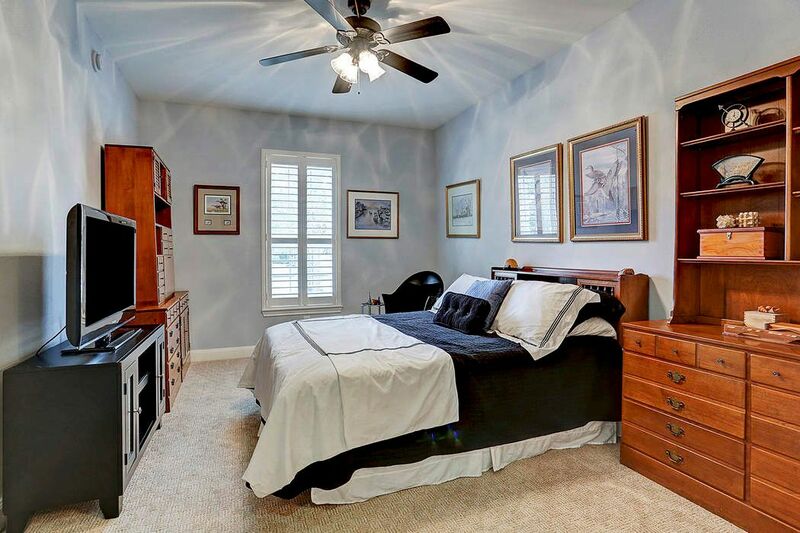 The master suite is privately positioned at the back of the home. 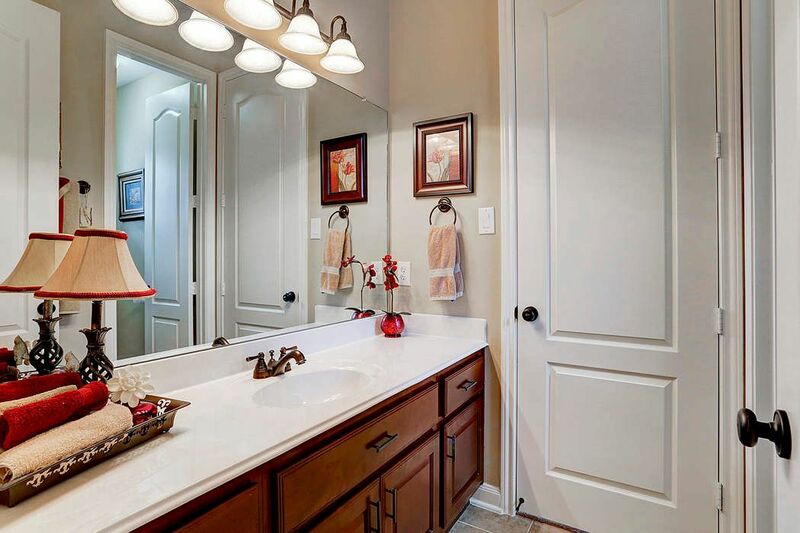 It enjoys lots of natural light, and the master bath rivals any spa.